YouTube user Sean Symons spotted this driver texting while driving and maneuvering the car quite erratically. He called the police, but decided to follow the car at a safe distance and document the unsafe driving that was taking place. Watch what happens next. Thankfully, there were no serious injuries. Do not text and drive! If you need any more proof, I recommend revisiting this mini documentary. Everyone probably remembers that wedding entrance from a couple years ago that went viral. Well, telecoms company T-Mobile (until it becomes AT&T) still produces advertisements and this one is a brilliant combination of that original viral video and the a royal wedding spoof. Apparently, Prince William and Kate Middleton are getting married soon. That song is “House of Love” by East 17. Ikea: The furniture maker has been aggressively looking at “pet furniture needs” according to this YouTube video. They created the Hundstol, or a high chair for your dog. Call me crazy, but I think people would actually buy this. ThinkGeek: The site unveiled a mini Apple Store playset. Complete with accessories, it even features Steve Jobs making a presentation. Again, people might actually buy this. 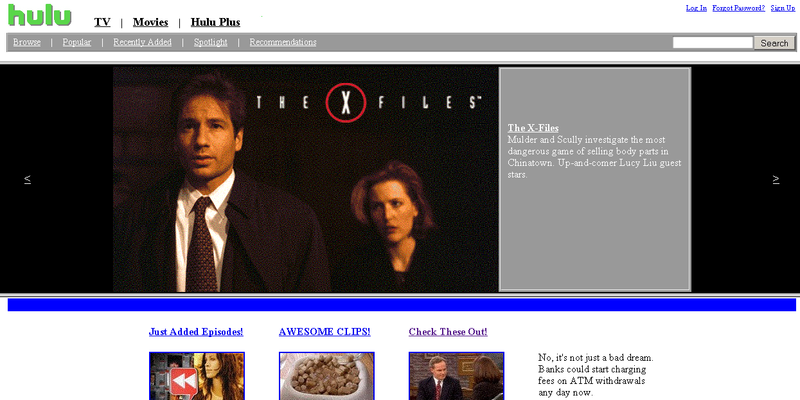 Hulu: Awesome site design makes everything look it comes from the mid-1990s. Complete with era-appropriate TV shows as well. Ivar’s: So this one is pretty Seattle-specific, but hilarious just the same. Unless you’ve been bured in a hole for the last few months, you know that Starbucks decided to drop all words from its logo. Well, Ivar’s appears to have copied them with this latest brand redesign. YouTube: Really only one here. So, for their April Fools prank YouTube decided to create a page that would enable the user to relive videos from 1911. As Gawker points out, every video on the site (formerly) allowed the user to click a “1911” button that would strip things of sound and add some weird music. For some videos, this was funny. For videos about 9/11 or the recent Japanese tsunami, this was horrible. Someone didn’t think through that one very much. On a lighter note, they did produce a funny video in the theme. Eminem joined a very select club this past week, though he might not welcome his company. Along with Justin Bieber and Lady Gaga, Eminem now has 1 billion views on YouTube. Despite many critics claiming his career was on the decline, the Detroit rapper proved them wrong in 2010. His latest album Recovery landed 10 Grammy nominations and 2 Grammy awards, and sold more than 741,000 copies in its first week. That album landed him his three most frequently watched YouTube videos: “No Love” (46 million), “Not Afraid” (203 million) and “Love the Way You Lie” (292 million). The artist has made the transition to the digital age. Three million Twitter followers, 29 million Facebook fans and topping Billboard’s Social 50 in 2010 prove that. For a while it seemed like third place to one billion views might go to Michael Jackson. When Justin Bieber hit one billion views last year, the King of Pop had 600 million. He’s lagged behind since then though (he’s at 630 million now). Contending for forth place include artists like Shakira, Britney Spears and Rihanna.